Citrus Fresh™ Essential Oil Blend combines Orange, Tangerine, Grapefruit, Lemon, and Mandarin oils with a hint of Spearmint. 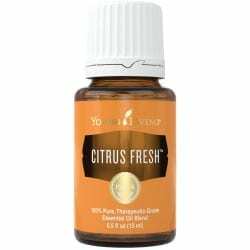 Citrus Fresh™ Essential Oil is a proprietary Young Living blend that offers an uplifting, refreshing aroma that you can diffuse to transform home, work, and classroom spaces. Citrus Fresh Essential Oil Blend is a relaxing, calming blend loved by children and adults alike. Rich in the powerful antioxidant d-limonene, it supports the immune system and overall health* while bringing about a sense of well-being, creativity, and feelings of joy. Citrus Fresh Oil Blend is perfect for freshening the air. Citrus Fresh has a balancing effect and can be very calming and relaxing. Add Citrus Fresh in your water for a sports drink that tastes refreshing and contains natural electrolytes! I love to put a drop of Citrus Fresh in my water. Citrus Fresh is perfect for those hot days because Citrus Fresh is refreshing to drink. If you like citrus and mint, then you will absolutely love this blend. Citrus Fresh contains five different citrus oils plus Spearmint essential oil for that minty after taste! Caution: Citrus oils should not be applied to skin that will be exposed to direct sunlight or ultraviolet light within twelve hours. grapefruit (Citrus paradisi), lemon (Citrus limon), and spearmint (Mentha spicata).